He has extensive experience in setting up and scaling sales channels team. Operations for international markets and today he's here with us to tell us a little bit more about how eCommerce businesses can take advantage of mobile Commerce and all there is to offer with that. Thank you and welcome to the podcast. Thank you Alan great to be here and looking forward to going through the mobile Commerce trans right now. Okay, great. That sounds awesome. It's really a lot going on in the in the mobile space as you already know, but before we kind of get into the. Topic of the day. Why don't you tell us in our audience a little bit about your background and how you got started with the company that you're with which is mobile apps, you know, everything that you were doing prior right as you rightly mentioned Alan. I've got about 8 and 1/2 years of experience of working on Sasson Cloud products mobile. Always been something uh, you know, which is of extreme High interest to myself and particularly when you look at Commerce, it's just the dominating sales Channel right now, right and it's only going to grow further so, you know myself and two of my co-founders are three of us together. Uh back in 2015 realized that you know eCommerce was growing at an extremely fast pace, you know today, there's always also been like a huge growth of entrepreneurs and everyone wanting to start their own businesses, right particularly about selling something online. So, you know, we saw massive group there. Also at the same time there was a huge growth of e-commerce software providers right Let It Be Shopify Let It Be Commerce Magento and all of them, right, you know these businesses just grew so we know we knew that they were solutions that solved a web, you know, but there was nothing that really created mobile storefronts with mobile growing and you know with the growth that it sees as a channel we thought you know, it's the perfect opportunity to enter at the time, you know, there were about 40 percent visits happening Via Mobile today. About 70 so it's just a channel which has gotten untapped on and uh, you know, it excited the three of us to typically start something where you know, we enable businesses with we basically simplify mobile Commerce. Okay for online businesses. Yeah, it's you guys were definitely right on time as most people see these days the amount of transactions now that are done on Cross mobile devices as has really exploded and I've seen this especially. Amongst the the millennial generation. I have some relatives and friends that are in familial generation. And most of them don't have laptops or computers that mean they may have their their mobile device some of them have uh, the, you know the tablets but the majority of them don't have laptops everything they do with regards to the internet is all on the mobile device. And so there's incredible shift that has changed and has come upon us within just a short amount of time. Because of that it has an F course you guys have seen it has caused businesses to really scramble and get there their whole mobile strategy together in a you know in a short amount of time and that you know, it brings me to kind of one of the first things I wanted to ask you because our audience is uh, primarily comprised of e-commerce businesses and people that have to do with economics marketing. So if a business these days doesn't necessarily have a mobile. Strategy in place. How do they get started? What are the some of the things that you suggest General, uh, mobile Commerce, you know as a term, it's a subject right? It's not just one channel, you know, mobile Commerce would obviously comprised of mobile web. You can mobile apps or let them be native hybrid and uh, you know, Progressive web apps is now catching up. So there's a lot happening, you know when this space so, you know when it comes to figuring out the right m-commerce or mobile Commerce strategy for. This is I think it really depends on what stage they are at right in their Journey. You know, when you look at startups that are entrepreneurs that have just started with their e-commerce website. It's all going to be about, you know, creating a theme that works best for mobile right to optimize their existing conversions and their existing traffic that comes from mobile when you're looking at a fast-growing or the high growth business. It's all about increasing conversions for them and increasing and generating new mobile revenues, which didn't really exist. And I and for that they would not only do this via their existing mobile websites, but they would also consider fully native mobile apps for both Android and iOS, and then you have Enterprises over your you know, and for them the key goals are always going to be conversions, you know, customer retention Customer Loyalty right in addition to revenues. 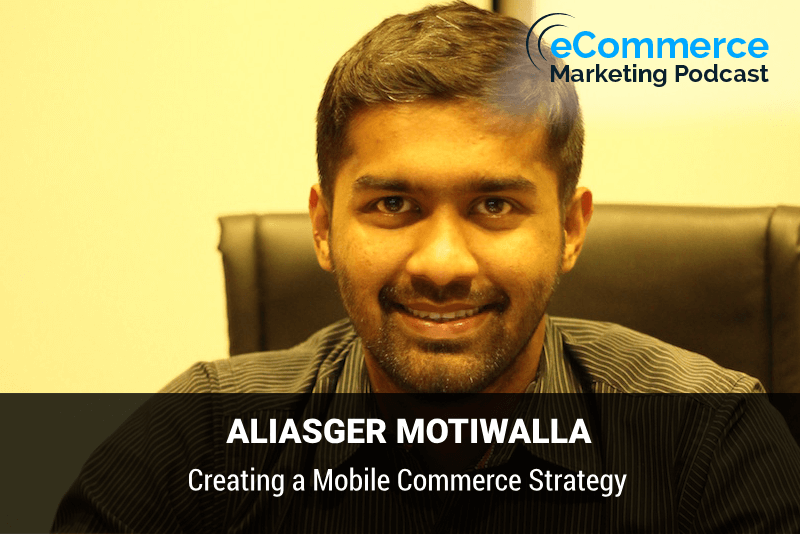 So at that stage, it's always going to be about everything related to mobile Commerce. Right? Let it be your mobile web Let It Be mobile apps, you know, they have to have it covered and it has to be spot-on. Go on the days when you know, it was a choice and it was a scenario where you want to consider it or let's not do it today. I think it's become imperative for businesses to you know, have a have in place an M. Commerce strategy. Okay. Do you think it's something that a business that's let's say a start-up just starting off do they need to think that immediately upon launching their present? I would say for mobile web obviously, but when you come to a mobile apps, right, I think it's a call that they need to take based on what kind of traction they're getting in their early days as a start-up as well. So if you look at the statutory, uh, you know over 70% of all storefront visits for businesses. Consumer stores that actually are hosted on Shopify mobile, right and it again depends on your region. There's a whole lot of data points that you're going to be taking in right demographics target audience and a whole lot of other factors, right? And when you look at all of that if you get some sort of fraction going from mobile over there, then it's all about optimizing that and then making it your predominant channel, right? So I wouldn't say that, you know, it's about it being on day one. I think it's about the data that gets driven. For these stores in their early days if mobile is contributing, which I'm assuming, you know, it does cannot over very large extent across various Target markets industry sub-industries and obviously regions as well. Then yes, you know mobile would be a very good investment from the word go because you get to build your audience from the word go as well. Right? That's the totally makes sense. Now. I know a lot of the businesses out. There are in different spaces different Nature's some are selling retail some are service-based businesses providing. Variety of different types, you know dealing with different types of customers what regards to actual mobile app what types of businesses should really highly consider creating a mobile app because I know you know, it may not be right for you for every business. Yes. That's right. So, you know and I think that's a great question. So, you know when you look at mobile apps in particular, right? It's a channel that you know, you're taking off some form of real estate on a person's mobile device, right? It has to be a meaningful aperture users actually going to use a lot of times. So when you look at eCommerce is a vertical there are obviously various categories in it, right you look at retail you look at a clothing business you look at accessories and then you have products like you're driving gears right or bike riding gears now. It depends on the purchase or the kind of pipe or the number of times you would actually buy that item. So you look at pet supplies as a business when you look at clothing as a business accessories as a business. These are things where. Uh, you know, you will Chop on very often right perhaps once in a month twice a month or once in a couple of months at least, you know, so with these type of businesses, let it be let them go high growth business and be an Enterprise a mobile app becomes really really relevant, right? Because you know, we were in fact are like to actually mention away there's a reporter which is published recently by pretty it is, you know, I'm sure you everyone Put It Forward of create here. You know, what they mention is 200. 86% It doesn't 286 percent increase in products food for an mobile browser. That's the kind of impact over there which results typically in an add to basket rate of about 90% now convergence always going to be higher moral lapses mobile web, but you know, why and what kind of business everyone related to e-commerce everyone having our transactional value to their business and everyone having users that actually keep buying from them off. That's where mobile apps actually come in. Gotcha, gotcha. So that makes sense. As far as from a marketing perspective with a company that has a mobile app or what are some of the marketing opportunities that are that would be opened up for that business. If they actually create a mobile app, you know things that they couldn't necessarily do without having a mobile app. You know one of the markets paintings and the most standard is is you know, by having a mobile app over here is the engagement Factor, right? You know, you have traditional channels today like email with its penetration today with everyone really having a device if the users actually even download the app once you can just reach them instantly, right? So there are push notifications that can be sent out to them for first time. You know, it could be about your offers. Hello. Excuse me. If you can actually repeat that answer we're gonna edit this but I lost you you kind of dropped off there was silence for sure. So if you can just repeat the Charles answer and then we'll edit this impulse shop. Can you help me now? Is it better? Yes. Can you hear me now Alan. Is it better? I can hear you now, so, you know when you look at businesses marketing themselves, right? They use channels like. Male social and whole lot of things right? But this is extremely crowded space Let It Be email at be social Let It Be everything with consumers or a user's mobile device, right? And once the user actually downloads the app you can send out highly targeted engagement campaigns for the user. So it could be revolving around, you know, first new products on the story to be about new collections launched on the street could be about an offer a discount. You know, it can also get into details on personalization based on the use of behavior on the mobile app. So, you know some of the ways to get your marketing and place and how marketing has progressed as well. It's all about personalization, right and mobile apps actually give you the easiest way to handle that. Yeah, that's that is very true. As far as personalization is concerned because you know, you've got that particular person that I guess one of the things that you can do is when they download the app and install it, you know, you can you can ask certain questions and so you can kind of personalize their experience to an extent so that. Things that you announced to them could be targeted just for them based on their quote unquote Persona that they set up when they create the exactly and that I guess can involve certain push notifications that you know, that will come to them as opposed to someone else. So those push notifications could be could be different based on, you know, their profile. I thought of an example. I have Netflix. I have a Netflix account even though I primarily look at Netflix on my Apple TV device. Have it on my my phone my mobile device. And what I've noticed is I have you know, three other people that I that that use my account as well that I live with and so I created special profile for my particular account. And so what I've noticed is that a new season of a new show that I watched comes out. I'll get a specific push notification just for myself because I that app was personalized for me. Whereas the other people that are tied to my account. They don't get that same push notifications. Don't get a specific notification for another show you watching so that yeah, you know, that's completely right darling. And so that's great. Yeah, and you know, that's that's the beauty of it and I think that's extremely important right because it has to be contextual. It has to be personal. Based on each user's behaviors on the app. So I'll give you an example of what our product does as well. So if you particularly install or you add a product to cut something as simple as you at a product at a product of car today, but you don't really purchase that within 24-48 hours. You get a personalized notification with your name and all details in that just reminding you to purchase that right. So that's just one of the examples that we have which we call as an abandoned cart push notification, but then there's a whole lot more. So what our product really also. Is you can Target in segment users based on geography is based on Age based on gender and a whole lot of actors, right? So that's where natural personalization really comes in right? It's not just about the use of persona, but it's about the use of behavior that he's done on the app. Right? So let's say there's a you know, you have someone by the name of Matt who's based in California, you know, he went on the app and he just landed up seeing the top viewed or the best-selling products but didn't really make a purchase right? Uh, so you. Personalized push notification after a couple of days giving him an offer only on those products that he's actually viewed, you know, so that's the amount of personalization and that's the experience that you'll end up creating with it. Right? Right. That's it makes total sense. Now, of course we've been talkin about about the actual transactional side of the mobile apps and you know, just getting people to purchase more of your products because you're opening up another channel for them to do it outside of the actual purchase. Of more of your products what are some other ways that a business can monetize things through a mobile app? So, you know, you obviously have them Commercial Way where these businesses sell their products within the apps, right? But, you know, there are other ways as well. So, you know, you have in-app purchases it could be about you know, let it be subscriptions. Let it be, you know as simple as some moisture some big. Retailer wanting to sell merchandise via stickers within the app, you know through that message and a message extensions. So there are a lot of opportunities when it comes to app monetization in particular, but we realized or what we've noticed is one thing individual retailers or e-commerce businesses, unless you obviously are an Aggregate and other things of that nature but you know Ecommerce businesses in particular, they don't rely on ads, you know for monetization because that just in the middle of experience, right? So that's something that they don't do your gender is. Stickers, uh subscription businesses as well in app purchases and there's a whole lot out there that is possible. But again, like I said, you know, it depends on what kind of business you are what stage at business you had at but you to start exploring other app monetization strategies, right? That's true. There's really a lot of options in another thing that I thought about that. I see a lot more of these days. You mentioned the subscription side of things where you of course are selling a specific product or service directly on your site through your app or through, you know, any mobile device but one of the things to kind of maybe pull somebody into a subscription model because these days. You know, every business is trying their best to try to take advantage of recurring revenue. And the best way to do it is a subscription service, but it's not as easy to set up or or to even structure for retail business selling a product. But what you can think about doing is creating some type of subscription model and that could be offered through a mobile device where you're providing your. In customer with exclusive content that they can't get anywhere else other than through the subscription and so, you know that that particular content could range from specific videos how-to videos are specific examples of how to use your product or advice on just different things that they've never really thought about regards to your product or Services, you know, there's a lot of things to that but that's that's something that I'm seeing a lot of businesses. Try to do is to really push people into this subscription model. Yes, and it's across from various categories all in there will be four businesses businesses a couple of retail businesses as well. You know scription is picking up tremendously as we speak right for sure. Now once a business gets a mobile lap, you know, they go through the process of creating a mobile app and and have it right there and they push it what's you know, of course, they've got to make sure that there's a return on investment for what they saw they spent. What are some ways that have business can can promote their their mobile app? I think you know, this is a big problem to solve our right for businesses because it's not just about getting their mobile app. But here's where the real problem starts, right? Uh, it's about getting app Discovery in place an app engagement and uh, you know engagement in place, you know, and analytics re app Discovery, uh is a problem that businesses generally look at solving by two mechanisms right one is uh, you know organic. Uh, which I think is the best way to go ahead with particularly with e-commerce businesses. What I teach starting up or fast-growing was is the Enterprises and then you have to pay models right there. You have paid marketing channels to basically acquire app installs. So as a product as well, this is something that we focus on because when we started we realized, you know, building apps was not the only problem there's a bigger challenge there. On how to use actually acquire app users how to users actually engage and you know, how you as a business can have insights and analytics to make Better Business decisions. So, you know when it comes to AB Discovery and when it comes to organic ways, you know, there are certain ways. We have something called as you know, Rectify tool within the product which essentially converts your mobile web visitors into Mobile app users. So it's a widget that we place on the business owners website both desktop and mobile and you know, it prompts users the typically down. The app as soon as a user visits the business's website. Okay. So, you know, that's a pretty tool that we've added with a product value at but I think it works really well, you know, we've seen conversions of very high conversions when it comes to app installed rates and click-through rates for that. You know. Yeah that that's one of the ways beeping is obviously. Betty very crucial Channel, you know, you have to have deep links on your apps because there's a lot of content that users share, you know before making a buying decision or a purchasing decision and you know, if you're after deep linked it just leads to getting better in app experiences or better experiences for you know people who are actually doing the content and which therefore is to increase in conversion. Sure, uh in addition to you notice. There's a whole lot of we actually do this at with our product as well. We recommend uh, you know growth marketing channels that users can use to you know acquire app you install so part of them in addition to these two going to be newsletters, uh, you know, you have newsletters that you sent out every month. You can include your wrap. You know, you have your customer service emails. Let them be your order confirmation email us your payment confirmation email us any form of email or basically that you send out to a customer abandoned cart emails as well should have your app links you then have social media, which I think is a very good Channel, you know Instagram today particularly with. Retailers is just you know become it's just gone through the roof as a channel, right? So, you know, those are areas that you can and then you know, you have your traditional mechanisms as well. Right? Let it be you know, what's happened, you know other mediums that you're typically communicate with your customers from that's a very important thing but yes, the best way is to have it on your website. So all your organic app or Organic website visitors both desktop and mobile can convert easily tour. So the bottom line is just in all of your touch points. You have their you want to make basically let your customers know your prospective customers know you've got the mobile app and then you know, exactly possibly even and I've seen this before with some of the major retailers where their encouragement for getting people pushing people towards the mobile app is a special incentive where maybe they'll be a special discount that they can only take advantage of from within the app. So that's another way to encourage people to yeah. I think that took it that's a great suggestion as well, you know, but when you look at discounts in particular. Right a lot of plans today are trying to do away with that and all fairness because not discounting was a very big mechanism earlier when mobile was just starting to be adopted but I think people are afraid from that because the adoption is anywhere there and I think that's great for the industry in general. Right right for sure. And finally one thing I wanted to ask is what's really one way for an e-commerce business to to start earning money right away when they first adopt. Mobile Commerce. What is one shop suggestion that you have? You know, I I think I generally would not want to but I think in this case I would want to bring this about you know, that's where our product comes into play right Global apps. That's what we do, you know, the whole ideas about simplifying mobile Commerce for businesses. So what we do is we. Enable businesses to instantly create their mobile Commerce channels both for Android and iOS, right and our vision is to enable them to generate new mobile revenues increase conversions customer loyalty and retention, uh at the earliest. All right. The whole idea is we automated the entire flow as a product where we build your apps. It goes live on both the app stores and the places for Google and apple respectively and like I said, you know, we have tools that help you acquire abusers will be every director tool that gets you your app users we play. That on your website does the day your mobile apps whole life and you know, we've seen massive results that because once you start getting your organic app installs, it's all about the engagement. So from an engagement perspective, what we've done is we've automated campaigns as a product. So every time a user launches the app for the first time he gets an offer he gets a welcome note from the business, you know, if he adds products to Cotton does not check out we've automated abandoned Cuts so, you know in our experience, you know, we've had. Parsons of customers across our journey and you know we've seen businesses being extremely successful in in the first month itself examples would include generating an upwards of even $25,000 and month one. It won't happen on the same day. I'm not saying it's not a possibility but I don't want to set that as an expectation. Yeah, you know, if you get things done in the first month, you know, if you just do the basic strategies, right? There's a very high probability of being successful within the first month itself. Right? Right. Yeah. I understand they won. It can be a little. That's a very high expectation. But yes, yeah, I think a one-month strategy may be to see some income from what you've set up Via mobile strategy is definitely and you know, it's a channel that grows right it. My perhaps might take a couple of months to get established. But once it's established, there's no Channel beating that channel. So, you know, it's about the investment that you make in that. Yeah, that is for sure. Well, I'll leave we appreciate you joining us here on the e-commerce marketing podcast. You've offered a wealth of information regarding mobile Commerce that I know will be of great value to our listeners. Now, if any of our listeners out there want to get in touch with you. How do they do it? You can directly write to me personally, you know, I love interacting with people, you know, it's part of, you know, something that I try doing every week. So yeah, you know people can be happy to reach out to me directly at Ali at mobile apps. Okay, great. Well, thanks again Ally. It's been a pleasure speaking to you and you have a great day and thanks for the info. Thank you so much. It was a pleasure to be here. Thank you again for inviting me and I'll just say all the best to everyone out there in this community with regards to launching their mobile Commerce strategies. Okay. Thanks. Again. Thank you for listening to the e-commerce marketing podcast. To access Ecommerce videos and other resources to help your business. Grow. Please visit get forward slash videos subscribe to us on iTunes by searching for e-commerce marketing podcast, and please leave a rating and a review.